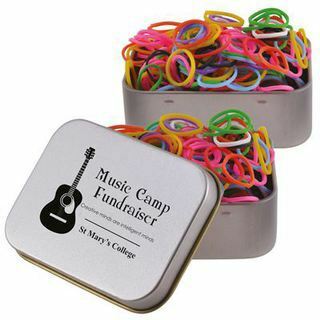 500 synthetic rubber loom bands with 20 sets of ‘s’ and “c” clips packed in clear poly bag, then in 2 piece silver rectangular tin with gold tin lining and rolled rim. Use to create colourful bracelets, jewellery, pencil toppers, keyrings, flowers, animals, action figures...the possibilities are endless. Get crazy with loom! Loom not included.